The Photo/Drawing with Values Measurement measurement function allows you to place measured values on a photograph or drawing image and save them. 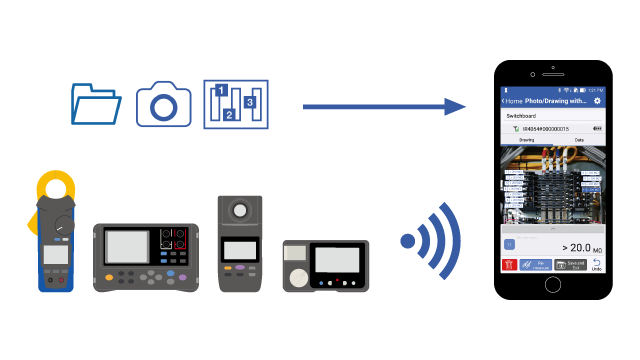 For example, you can photograph the circuit breakers you intend to measure; send measured values such as voltage, current, and insulation resistance via Bluetooth®; place them on the photograph; and save the result. Load an image from your photo library. Use of templates will be described later. If you wish to place measured values on a drawing, you can load the drawing image via your smartphone or tablet’s photo library. The app can load BMP, JPG, and PNG images with a resolution of up to 3,072 × 3,072 pixels. If you’re looking for an easier way to place measured values on a drawing, you can also photograph the drawing with your device’s camera. When you tap the image, the app will stand by for measured value input. Enter the value from a supported instrument via Bluetooth®. Enter the value using a numeric keypad. Up to 300 values can be placed on a single image. Sometimes you need to repeat the same measurement. One example of such an application would be measuring the insulation resistance of a distribution panel on a regular basis, such as during an annual inspection. If you were to take a picture of the distribution panel each time and place the values on that image, you’d need to repeat the same process every year. Instead, you can create a template by placing measurement points in advance on a photograph. You can subsequently use this template to eliminate the need to take the photograph and place the measurement points, allowing you to complete the job simply by entering measured values.